Etymology: "Butterfly Tree" because of the attraction of its flowers for the butterflies (as Red admirals, atalanta Vanessa and the European Peacock Inachis io). The name Buddleia is devoted to the reverend Adam Buddle, doctor pastor and English botanist (1660-1715). "Davidii" reminds the French missionary David (1826-1900), who explored the Chinese flora and discovered it in China in 1869. The plant fell again into oblivion until the doctor Augustine Henry (1857-1930), English botanist, rediscovers it in 1890 in the province of Se-Tchouan. The first seeds reached Europe in 1893. 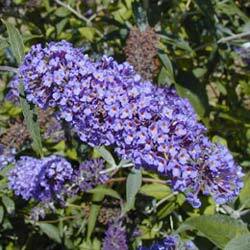 Habitat: Buddleia is easily acclimated in the North hemisphere, in sunny situation, on a drained soil. It is even intrusive and colonizes ballasts, waste lands, at the risk of destabilising the rip-raps of banks of rivers. Shape: upright and irregular. The flexible branches are grouped in bundles at the base and are curved in arch under the weight of flowers. Bark: brown, smooth on the young tree, becoming covered with lenticels more and more tight on the old subjects. Deciduous foliage. 10-20 cm leaves, disposed opposite, without petiole (or leafstalk). Form is oblong, narrow, lanceolate, and the margin finely toothed. The top is green grey to dark green, light green underside. 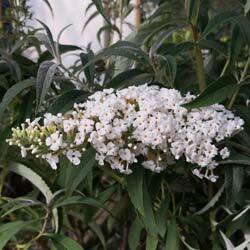 White, lilac or purple flowers, grouped in conical panicles raised at the end of stems. They appear in summer and can be renewed until early winter. They exude a light fragrance that attracts butterflies. They resemble the flowers of lilac, by their shape and color. Fruits: small capsules, in upright clusters, in winter. Use: decorative tree for its fruits only. Blossoming is of little interest. Cut the branches covered with flowers as and as they fade. This facilitates the development of new flowers throughout the summer. Prune dead branches in spring. It is possible to prune Buddleia at the level of the soil, to regenerate it. 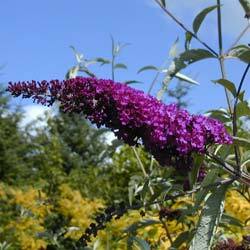 Buddleia does not have enemy or illness and it grows easily and spreads fast: the single shrub produces 3 millions of very light seeds, wich the wind carries away. In the soil, they can "sleep" for many years until favourable conditions. Its resistance to cold, heat, rain and drought aid in this survival. Also, one should implement it knowing the risk of colonization.
' Black Knight ' : purple flowers.
' Dartmoor ': remarkable for its inflorescences magenta / purple.
' Empire Blue ': flowers purple-blue 'of blue of empire'. 'Fascination ': flowers rose-lilac in panicles from 30 to 50 cm long. Vigorous cultivar.
' Harlequin ': white and green variegated foliage; ruddy crimson flowers. Less vigorous than green forms.
' Honeycomb ' ('nest of honeybees'): yellow flowers.
' Lochinch ': compact and dwarf hybrid; pubescent leaves. Flowers are colour lavender and gather in smaller bundles (15 cm).
' Nanhoensis ': more compact and more dwarf form; hybrids with white, blue flowers and purple. It declines in ' Nanho White ' with flowers of intense purple and with silver leaves, and ' Nanho White ' with the flowers of a pure white.
' Royal Red ': the best variety with red flowers. Panicles up to 50 cm long.
' White Profusion ': white flowers. Panicles 15-20 cm long.